Tasteem [Yummy Traveler #31] Kona Koffie Is The Favorite Corner "コーナー"
[Yummy Traveler #31] Kona Koffie Is The Favorite Corner "コーナー"
Along with the development of trends, drinking coffee is no longer just intended for coffee lovers. Coffee drinks up to now have many variations that make people who originally didn't like coffee, finally start trying and enjoying coffee. Drinking coffee symbolizes calm, take a break after being tired of doing activities. On the other side, drinking coffee symbolizes the birth of fresh ideas and brilliant ideas as fragrant as coffee. That is why many creative workers such as writers, painters, and other creative arts workers cannot work without coffee. Many street corners offer coffee shops to be a stopover, either coffee lovers or those who are not coffee lovers. 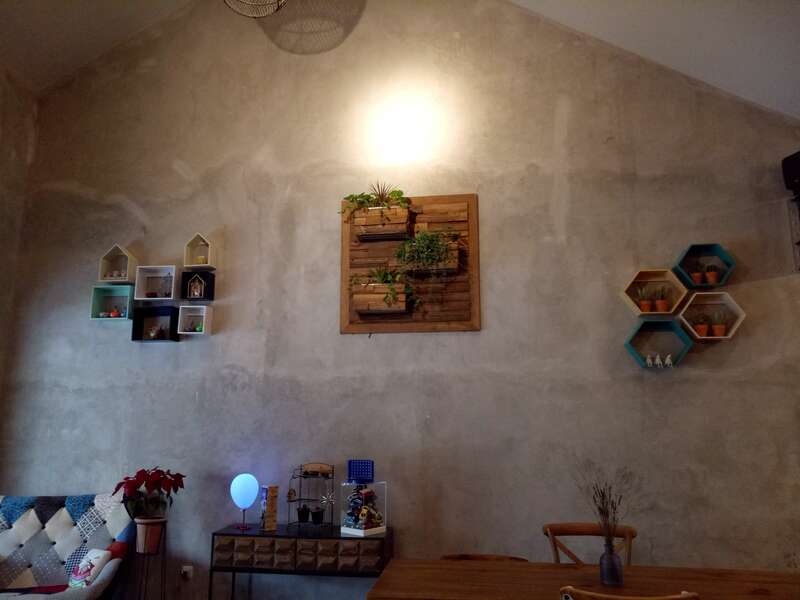 If you are in the Dharmawangsa area, South Jakarta, there is a coffee shop that is worth visiting. 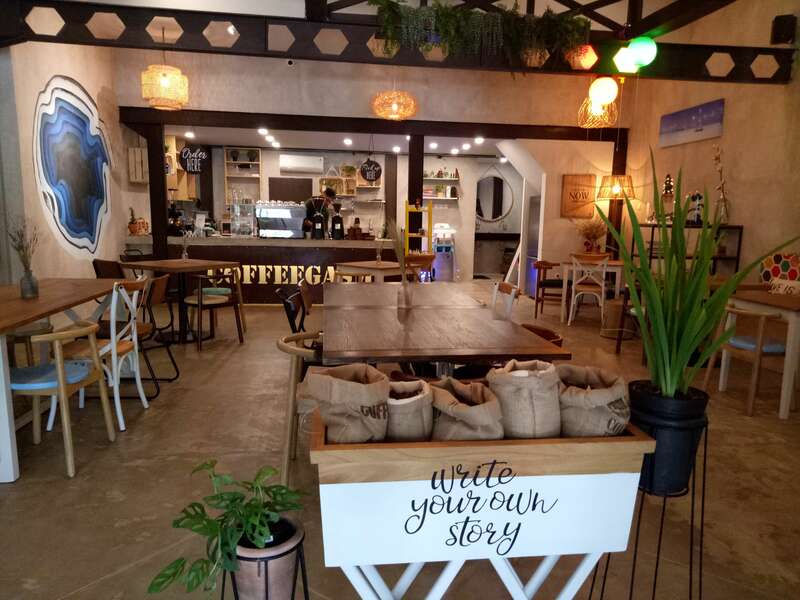 Kona Koffie is not just a coffee shop, but also offers comfortable corners for visitors to enjoy their day with Kona Koffiee's menu. Kōnā comes from Japanese "コーナー", which means corner. 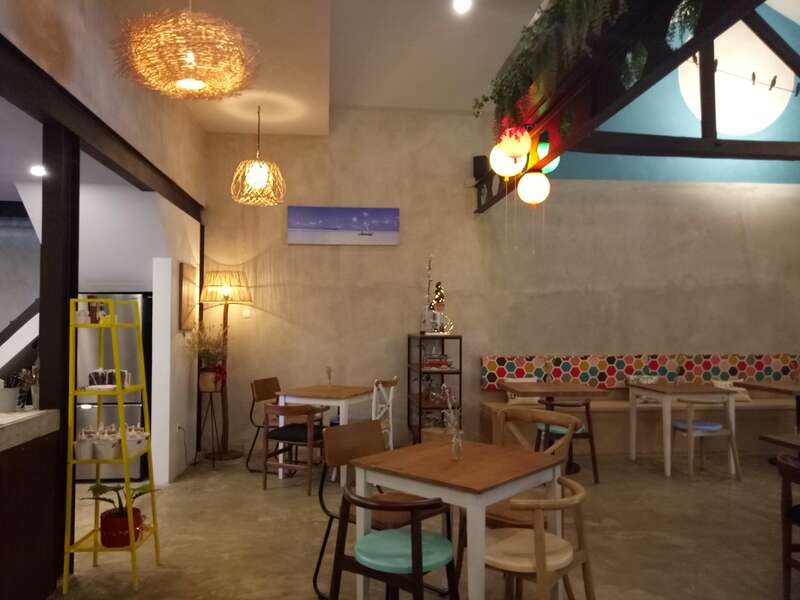 Kona Koffie introduces themselves as a coffee shop that is on the corner of the street, and we provide space for those who seeks a warmth, cozy place and of course. Coffee. 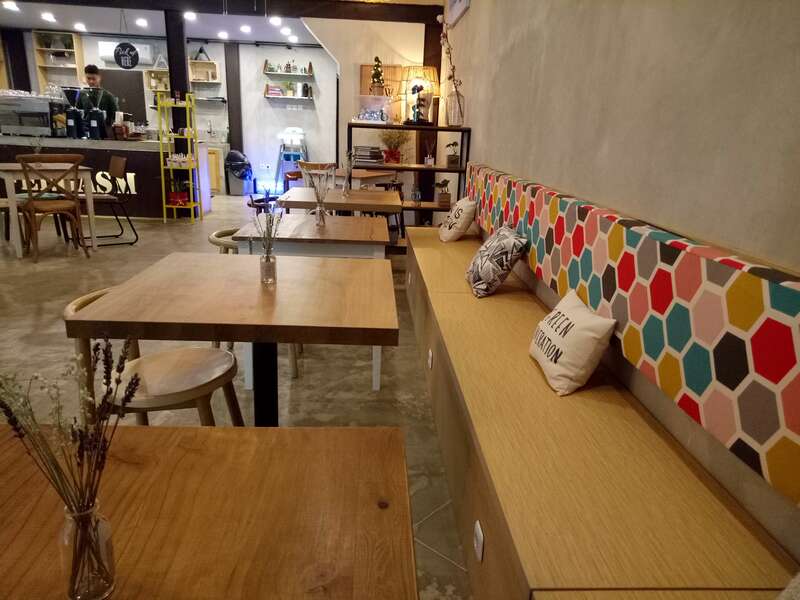 A corner to enjoy coffee symbolizes comfort without wanting to be disturbed by others. 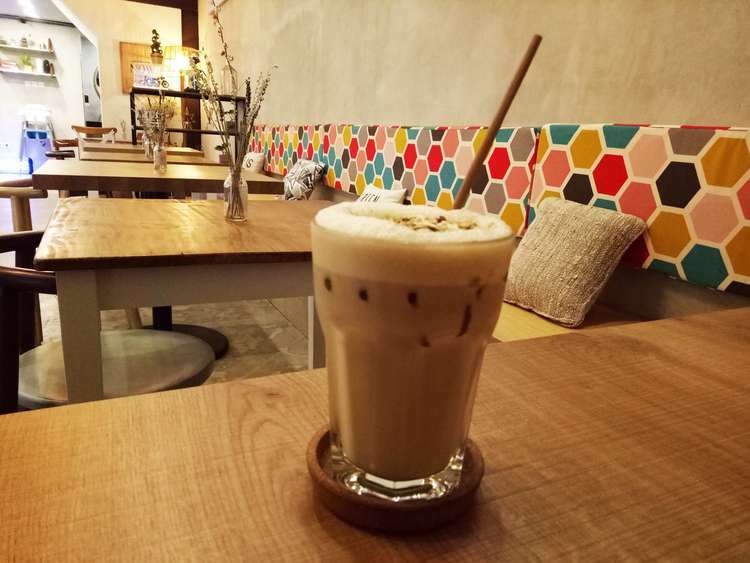 Alone or with friends, Kona Koffie wants to be a favorite corner for visitors. 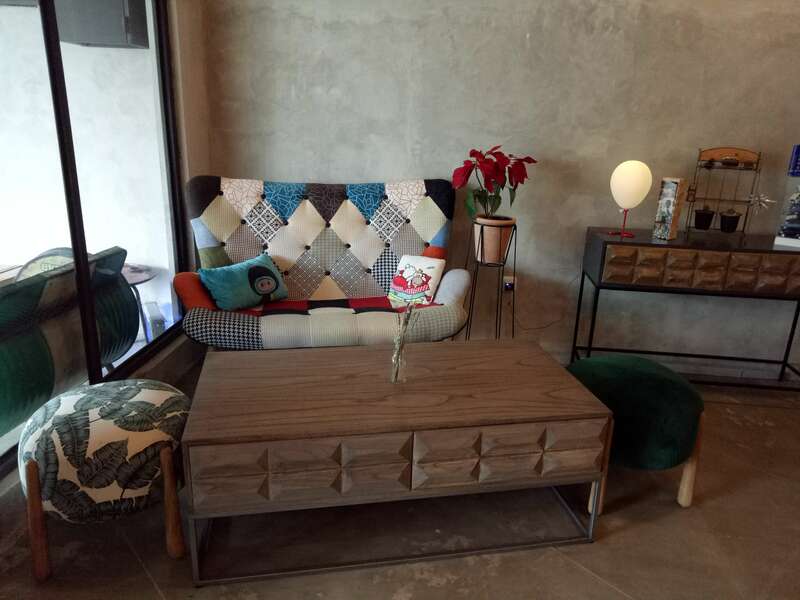 Kona Koffie has a rustic design concept. The rustic design of a room does not mean it is not attractive. 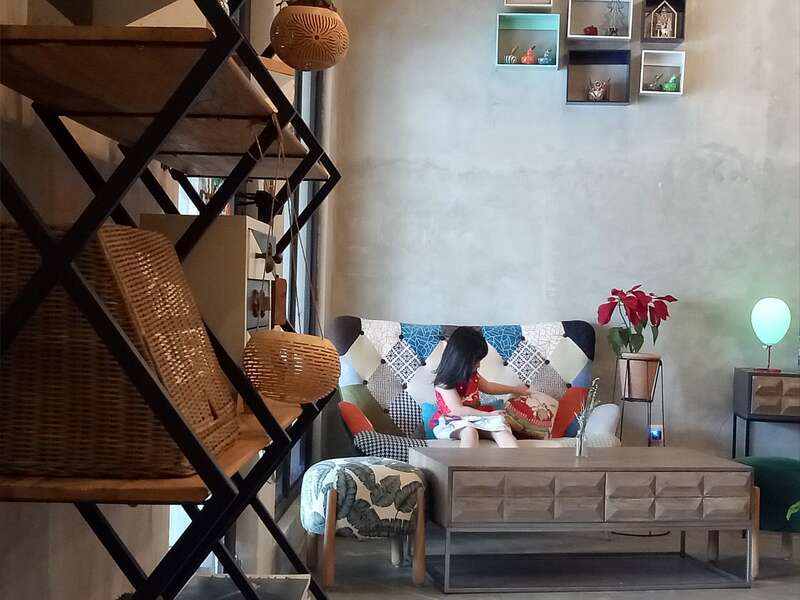 Although furniture and room accessories are left unfinished, they can give a natural impression, such as the texture of wood used for tables and chairs. The walls and floors were left unfinished. To anticipate the colors of the original textures of furniture and accessories in the room, elements of bright colors such as blue and red are added to the accessories in the corners of the room. The entrance area to the Indoor section has stairs that pass through the outdoor area. Green plants are placed on the edges of the stairs to give a bright impression on the building. 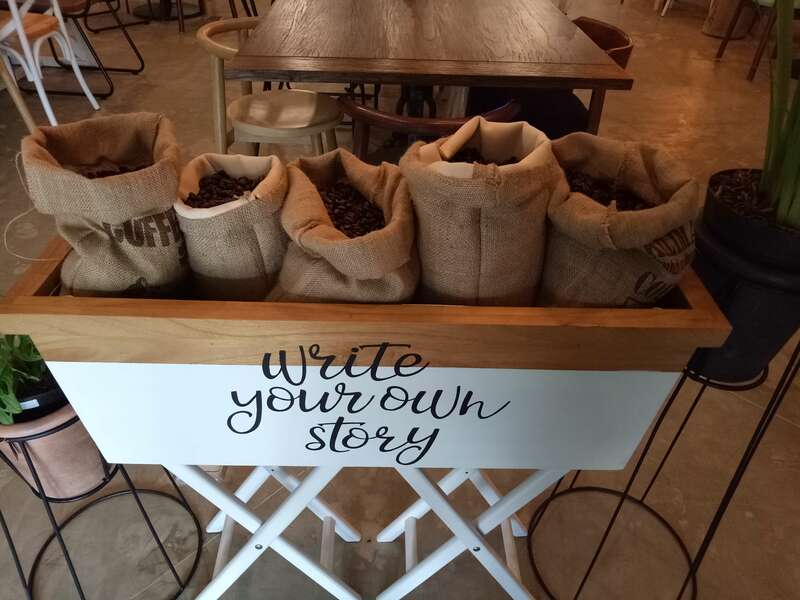 When visitors arrive at the entrance of the room, there are coffee beans that are welcomed with a quote-able marker with the phrase "Write your own story". In the corner of the room near the entrance, there is a sofa that attracts attention, with bright colors. This spot is a favorite corner for taking pictures. Look, there is a small child who is so cheerful when sitting in a corner of the room, and asks to be photographed by his mother. 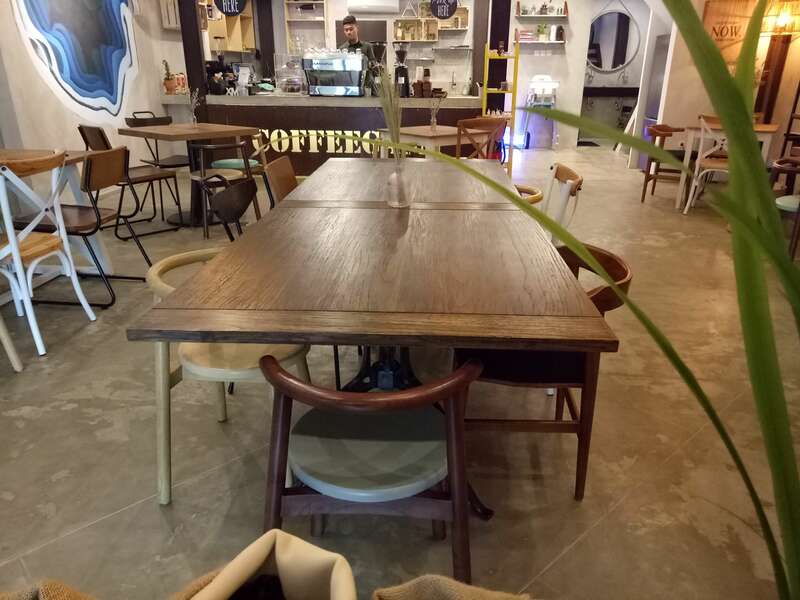 The center of the room is filled with large tables, suitable for meetings with friends, family gatherings, or even business, as well as small workshops. On the back of the sofa in the corner of the room given a touch of bright colors so that it displays a cheerful atmosphere, with a warm blend of the effects of using unfinished wood. There is also interesting photo spot using a background of brightly colored walls that form a "Tree Ring / Growth Ring" like the texture of a tree circle. And, in the open kitchen area as well as the order area, there is the words "COFFEEGASME" to confirm that **Kona Koffie ** offers coffee that makes visitors feel satisfied. 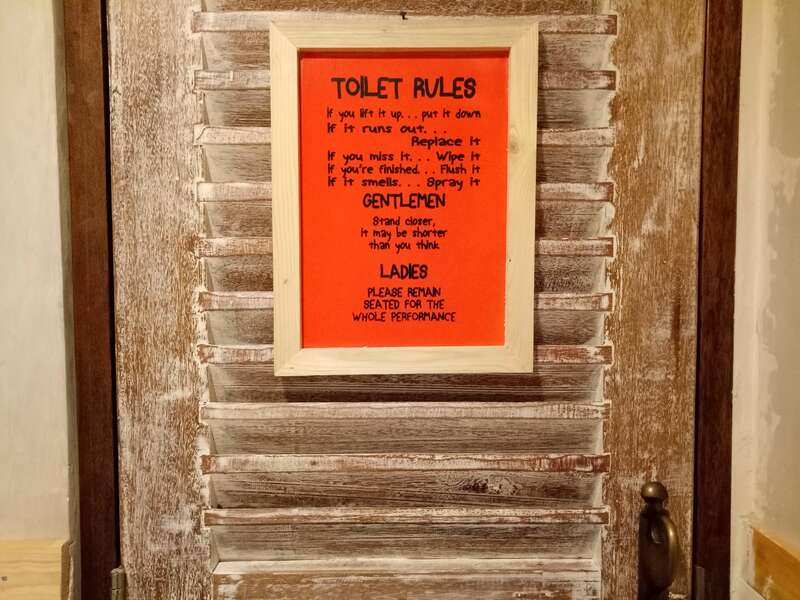 Usually I never photographed a restaurant's toilet. But this time I photographed Kona Koffie's toilet because the toilet was very clean! 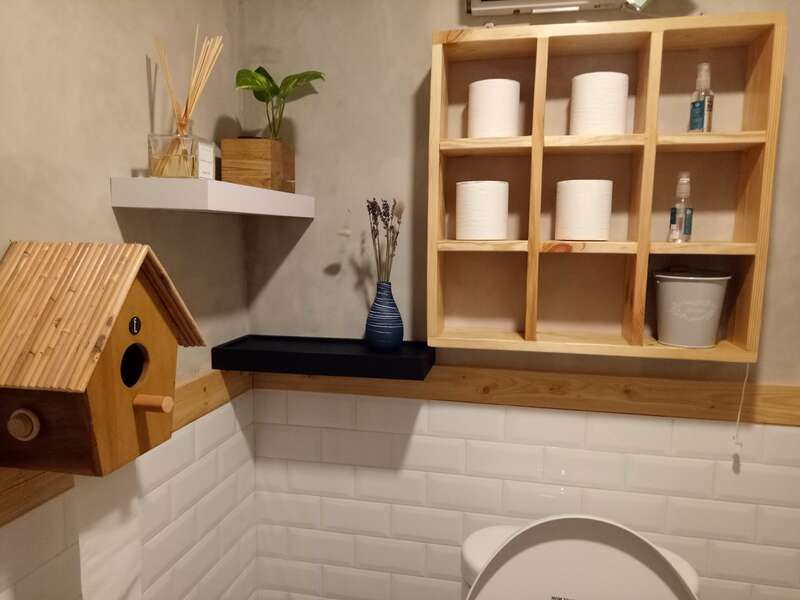 Visitors will really feel like home and don't hesitate to use public toilets. In the outdoor area, Kona Koffie looks a little different design than the outdoor area. If the indoor area applies a rustic design, the outdoor area emphasizes the impression of the industrial design with the use of recycled materials as furniture. Industrial impressions were used to support the Kona Koffie campaign with their tagline "LESS PLACTIC, DON'T PANIC." The tagline is used as LED Sign Lighting wall decorations. Regarding the campaign to reduce plastic waste, Kona Koffie uses environmentally friendly materials on straws and cups for take-out service. They replace plastic materials into materials that are easy to decipher, but are safe to use and still have strong ingredients when put in drinks. There are bar stool-style chairs in the corner of the room overlooking the street area. While for other areas, there are chairs and tables that are shorter than those in the indoor area. 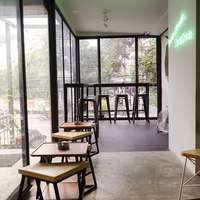 It adopts the concept of corners in street coffee shops for smokers and is more free to chat with friends while smoking and drinking coffee. 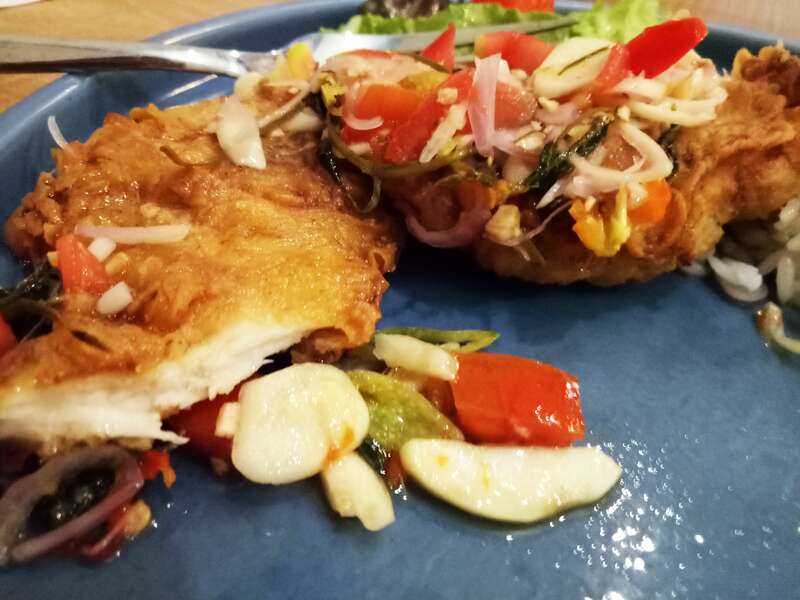 The dish offered by Kona Koffie is a menu that is hard to forget. Kona Koffie has the signature foods and drinks that make visitors come back, just as I honestly will come back to Kona Koffie. 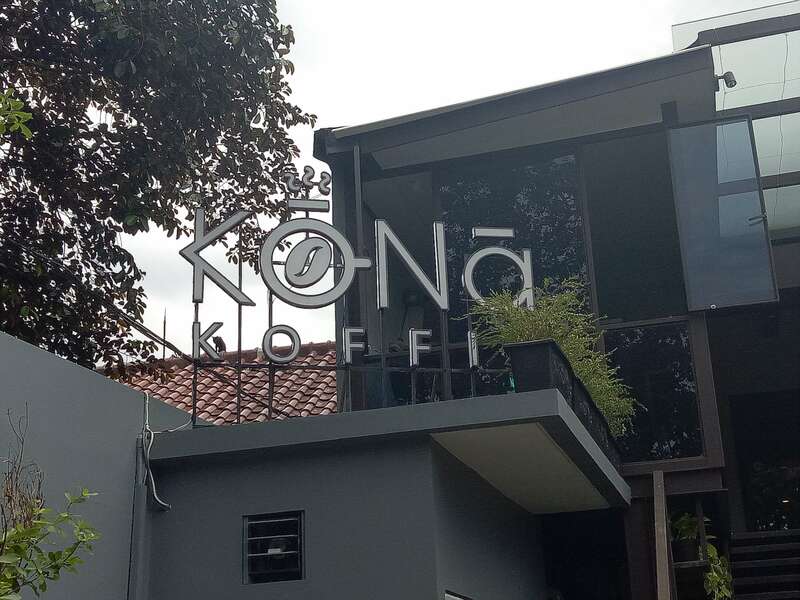 Kona Koffie provides drinks not only coffee, but also tea, latte and juice. 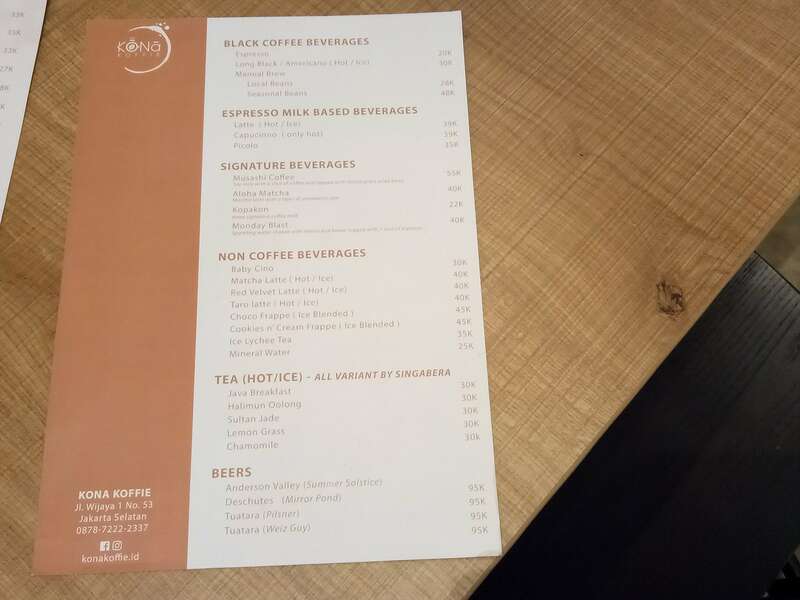 If you are confused about what drinks to order, I suggest you to see the Signature Beverages list. Soy milk wita a shot of coffee and topped with muesli grain dried berry. Matcha Latte with a layer of strawberry jam. Sparkling water shaken with lemon, and honey topped with one shoot of espresso. This place really made me feel at home sitting in the corner of the room. Kona Koffie is indeed a favorite corner. At first I ordered a maincourse, Chicken Sambal Matah for lunch. "Sambal Matah" is one of the typical Indonesian chili sauce. This chilli flavor is very characteristic with fresh onions, chilies and tomatoes. This Sambal Matah makes chicken/fish taste good. 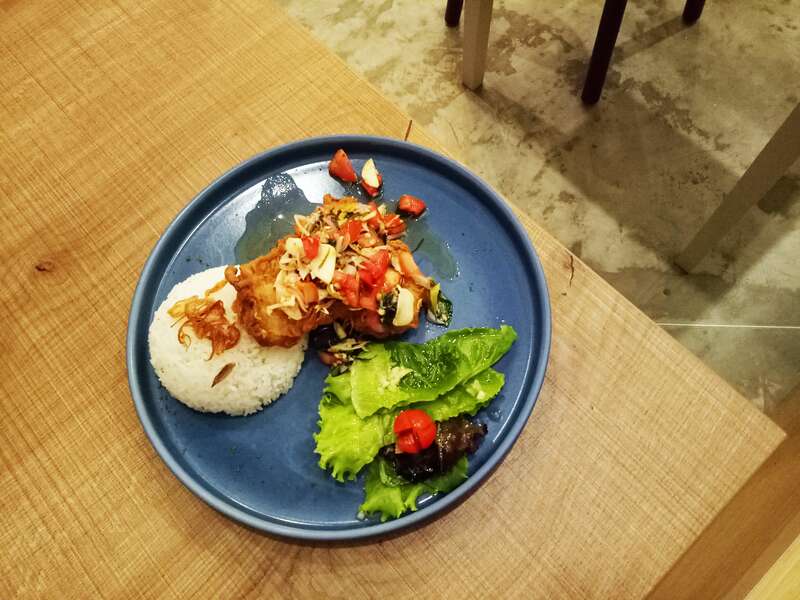 Dori or chicken with the sauce "Sambal Matah" has indeed become one of the maincourse bestsellers at Kona Koffie. I admit that Chicken Sambal Matah is super delicious! The spices that wrap the chicken with Sambal Matah are soaking well. 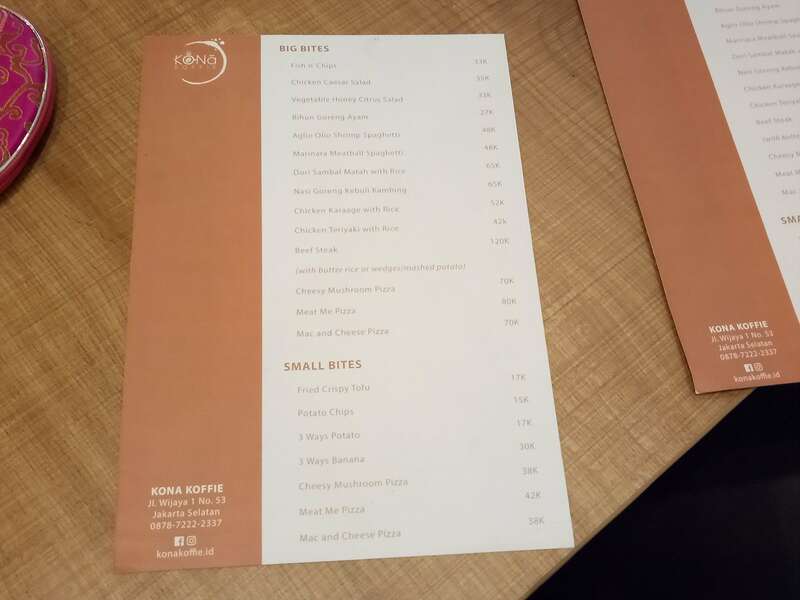 This makes the visitors will have a strong memory of this menu and will return to Kona Koffie again. The maturity level of the chicken is good, and it feels crunchy on the skin. Perfect! 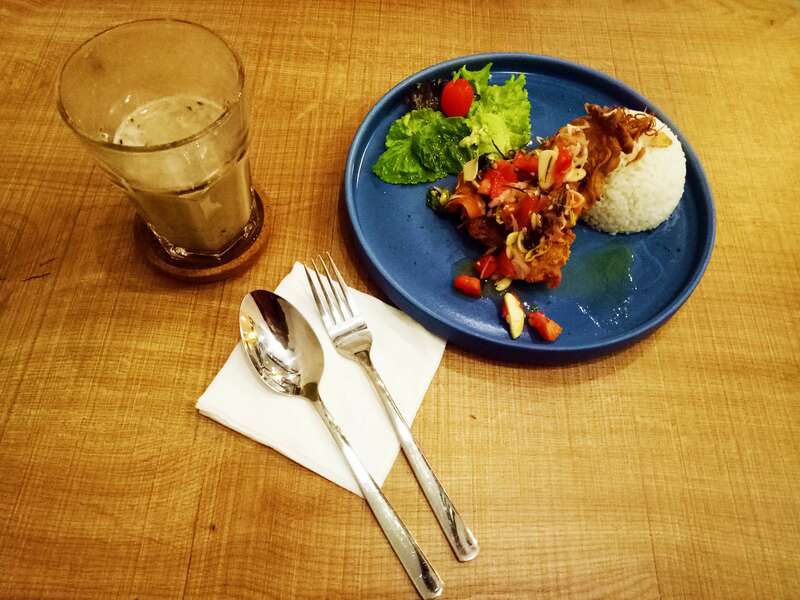 Now I have a new taste reference about the delicious "Chicken Sambal Matah". Because I am confused about what order to drink, then I immediately list the Signature Drink list. Then, I decided to order Musashi Coffee, with a name and composition that attracted attention. 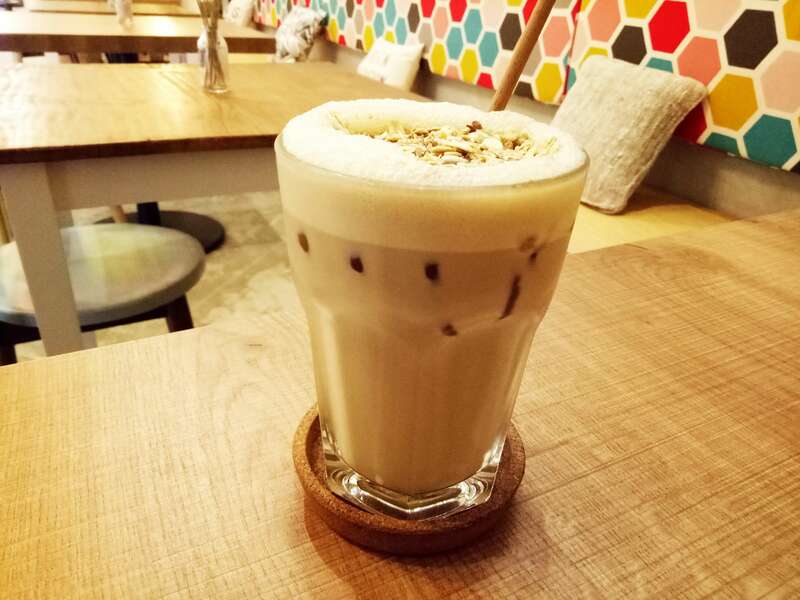 This drink consists of soy milk, coffee, and is equipped with topping muesli grain dried berries. You must try Musashi Coffee if you only drink milk coffee so far. The taste of the coffee is still strong even though it has been mixed with soy milk. I enjoyed my time at Kona Koffie for a long time while working on my writing work. A few hours after eating Chicken Sambal Matah, I felt hungry again, and finally ordered Small Bite food. I ordered a small size of Cheesy Mushroom Pizza. When the order arrives, it doesn't disappoint! The taste and presentation deserve to be appreciated. The texture is crispy, unlike pizza in general which has a main dough that is too thick. 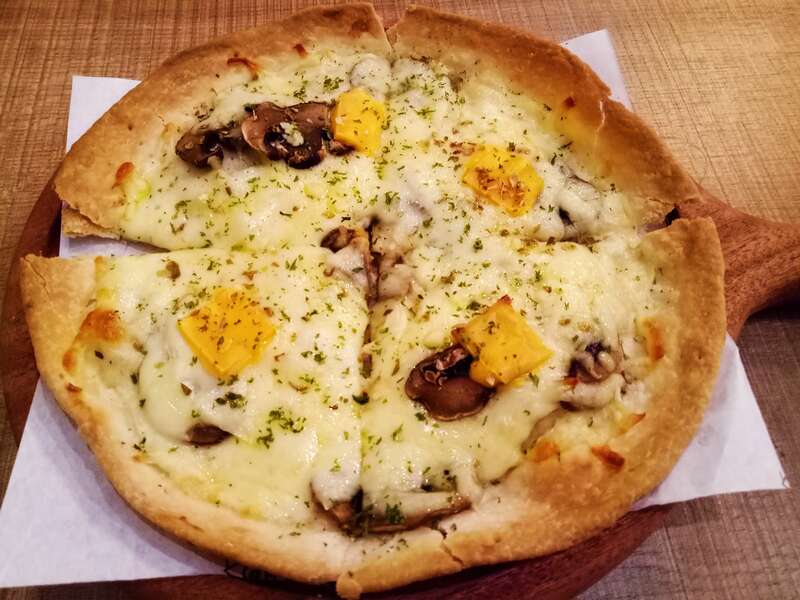 Cheesy Mushroom This pizza is very fun and satisfying to eat. 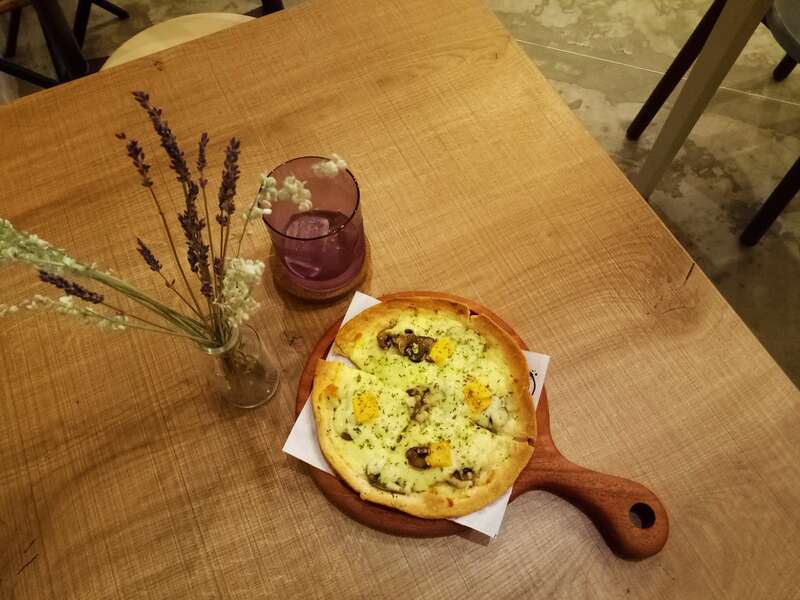 I suggest you try Cheesy Mushroom Pizza to accompany your time. 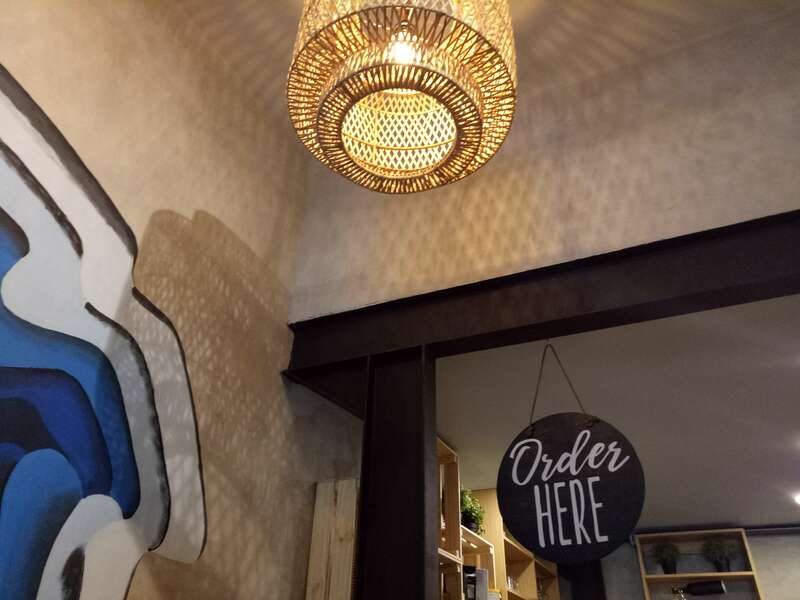 If you can't to come directly to Kona Koffie, you can order via online! 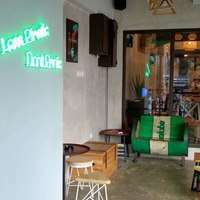 Kona Koffie is a favorite corner for relaxing, chilling out and enjoying delicious menus. 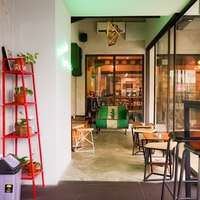 In accordance with their name, Kona which means corner (コーナー), Kona Koffie can be an option to stop for a moment to relax in a city as busy as Jakarta. Coming alone or with someone, it doesn't matter. 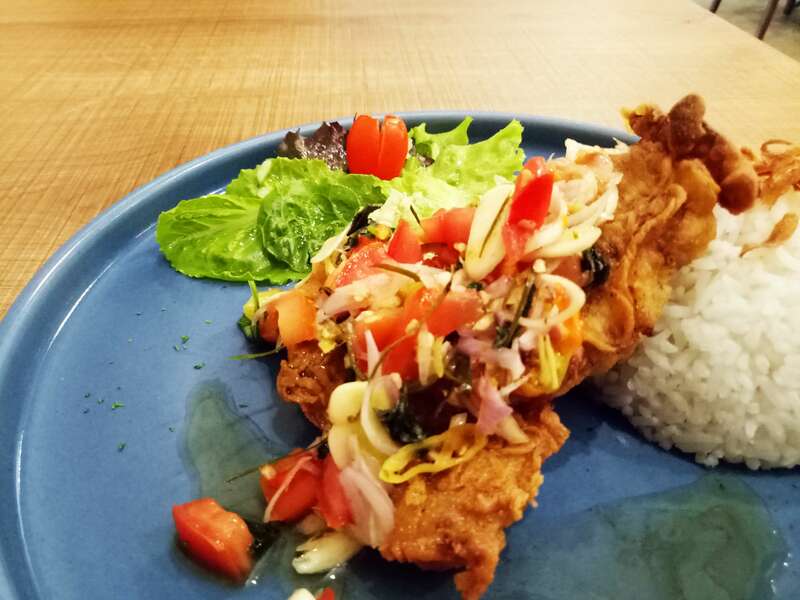 Choose your favorite corner at Kona Koffieand love yourself by enjoying a delicious dish from Kona Koffie. Please watch the video below to feel the atmosphere of KONA KOFFIE. 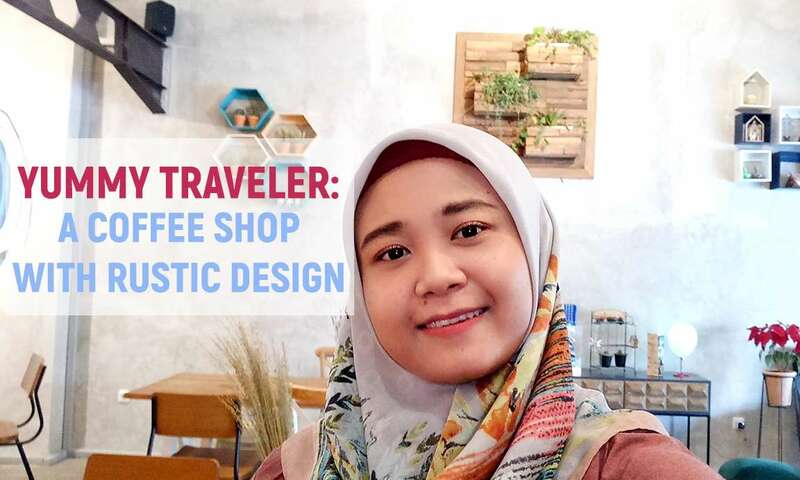 See you at the next Yummy Traveler! 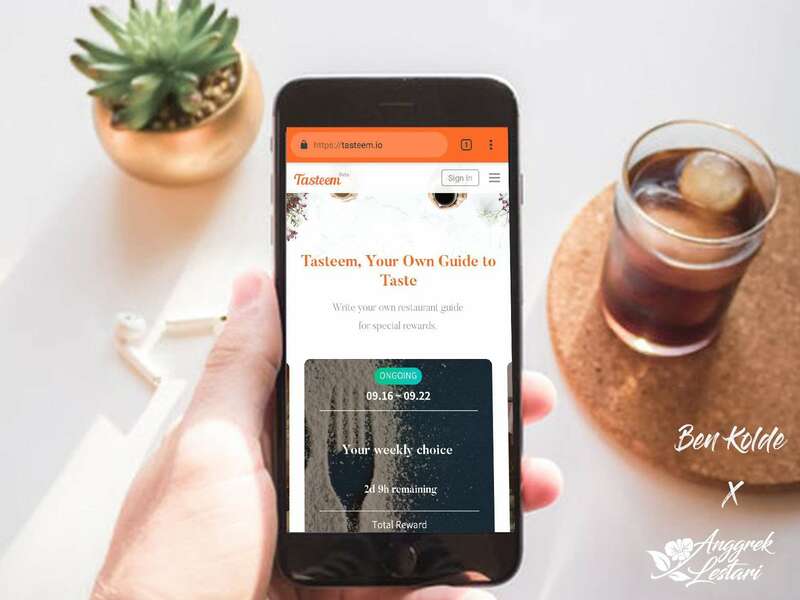 PLEASE READ "EVERYTHING YOU NEED TO KNOW ABOUT TASTEEM"
I wake up and see coffee😍😍 eat.. Yumy. Thank you have a nice weekend! Yeah, the coffee is really delicious. Thank you for entering our <Your weekly choice > Contest . Thanks to @anggreklestari, Tasteem has become a more attractive guide. We upvote your post, wish you the best of luck in winning our Contest! 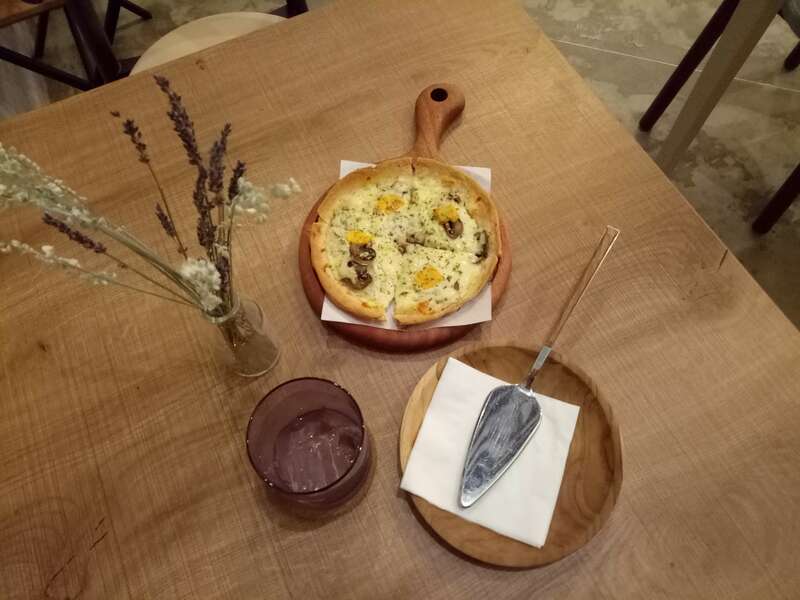 Yeah, the place is very cozy and the food is superb delicious. Your post was upvoted by @steem-ua, new Steem dApp, using UserAuthority for algorithmic post curation! Your UA account score is currently 2.907 which ranks you at #11710 across all Steem accounts. Your rank has not changed in the last three days. In our last Algorithmic Curation Round, consisting of 216 contributions, your post is ranked at #72. 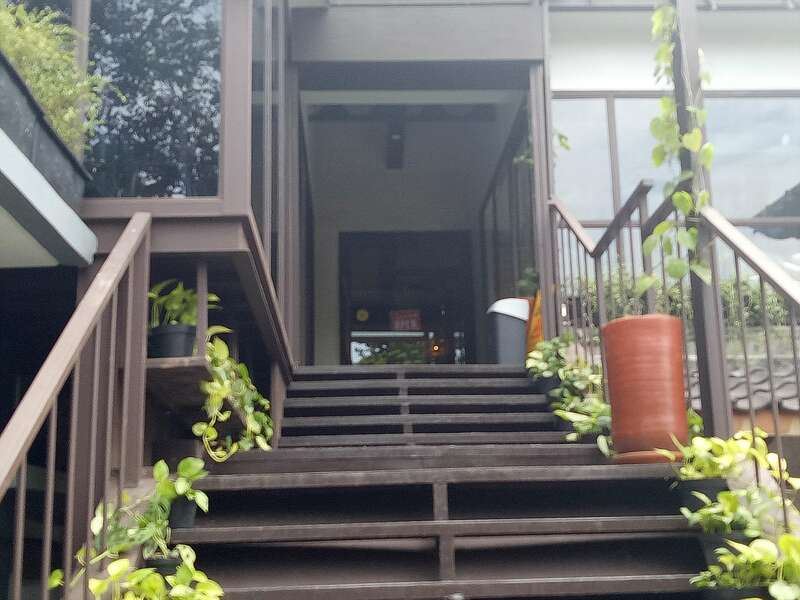 Great review @anggreklestari, the place looks really beautiful and comfortable too. I would love to visit it one day. Great review! I wish I could bite that pizza!! 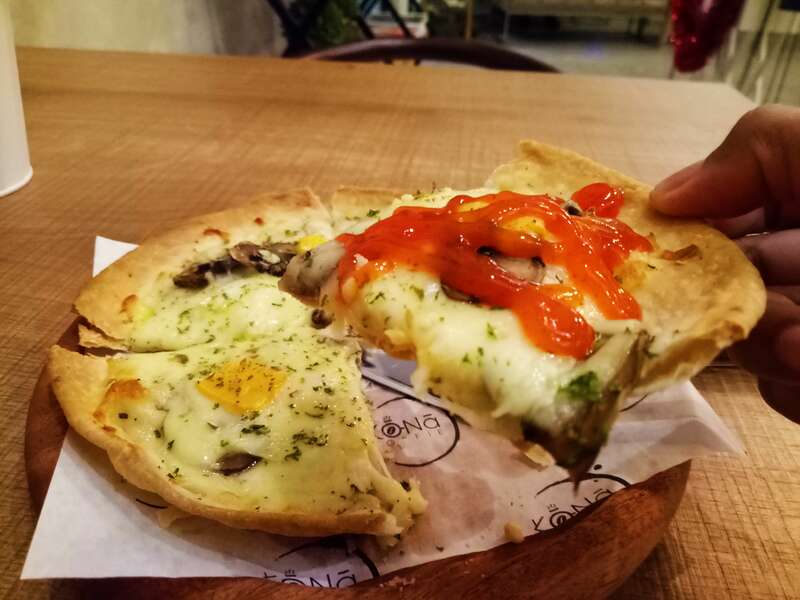 The taste of pizza is unforgetable.